SMBKZ started as of January 1, 2017, following the business integration of Sumisho & Mitsuibussan Kenzai Co., Ltd. and Marubeni Building Materials Co., Ltd.
Building on the combined strengths of both companies, SMBKZ continues to develop across the board and provide services for all manner of construction projects. To continue meeting customers' needs in the future, the company intends to keep on extending its specialist expertise across all areas, and to bring individual strands together to strengthen its overall capabilities, as part of an even wider array of business activities. SMBKZ's highly experienced staff provide a wide range of design services, from structural planning to finished designs, for purposes such as building wooden structures or planning office spaces. 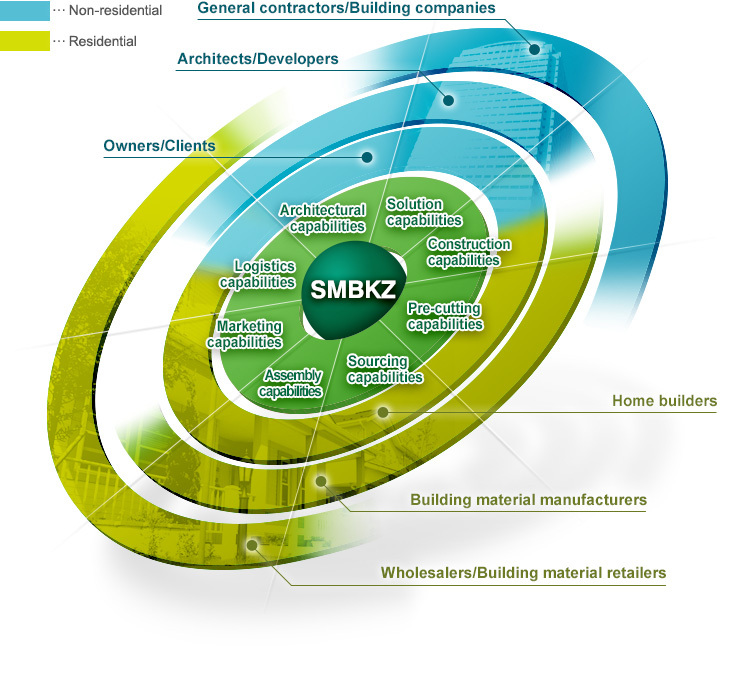 SMBKZ offers fast and unique building solutions. SMBKZ provides overall solutions, from layout drawings to relocation, for a wide range of projects, including organizing equipment for commercial facilities and renovating offices. SMBKZ acts as a one-stop shop to resolve any and all issues facing its customers. SMBKZ provides in-house design and construction contracting services, including wooden structures, non-residential interiors and exteriors, residential external walls, commercial and retail premises, and office spaces. SMBKZ offers world-class construction capabilities, underpinned by in-house management and a specialist structure covering various fields. SMBKZ provides processing and pre-cutting services for residential external walls via its own affiliated plant. SMBKZ also strives to improve customer satisfaction and contribute to society through initiatives such as shortening construction periods, reducing emissions, improving conditions for onsite workers, and saving labor. SMBKZ combines expertise from Mitsui & Co., Ltd., Sumitomo Corporation, and Marubeni Corporation with its own global network, underpinned by a proved track record as a building material trading company. SMBKZ provides customers with a reliable supply line for materials from home builders and building material manufacturers in major producing areas around the world, in terms of both quality and quantity. SMBKZ scours the world to find the quality of materials its customers require at the right price, and combines base and coating materials to produce finished products. SMBKZ can reliably secure and provide materials and products that meet its customers needs. SMBKZ uses its worldwide network to gather information so that it can provide its customers with whatever information they require, including construction data based on specialist knowledge, information on legislation, government policy and industry, and the results of market research. SMBKZ has established an international distribution and stock management network, harnessing its unique global network and economies of scale as a trading company. SMBKZ can deliver a whole host of products reliably and effectively.